Bring a touch of purple rain to your manicure with our plant-based Prince nail polish, complete with a regal dose of shimmer for a finish that shines under the spotlight. PURE color is a range of cleaner, greener, 10-free nail polishes. Thumbs up to that! - Enriched with plant keratin and starflower oil to make your hands happy go lucky! Simplify your life (and your manicure) with our 2-in-1 Base & Top Coat. Goodbye petrochemical solvents and hello plant-based replacements! Our PURE color range contains solvents derived from natural origin, renewable raw materials such as cotton, maize, potato, wheat and manioc. For a manicure that goes the distance, make sure your nails are clean of any oils, creams or rogue cotton wool fibres. Remove old polish and then wash and dry hands thoroughly. 1/ First up: apply base coat. 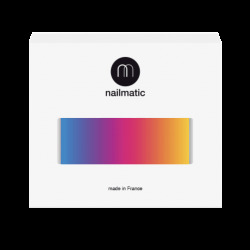 Not only does this protect your nail and provide a smooth surface for your polish, but it will also make removing color easier. 2/ Apply one coat of Prince in three easy brushstrokes. The first down the centre of the nail and then one on each side – it’s a piece of cake thanks to our wide brush! 3/ Add an extra coat for more intense coverage and longer-lasting color. 4/ Top coat optional but we highly recommend for increased shine and hold! • Go all out and wear this color with going out outfits – white, sequins, satin – go for it! • Is it chic or a faux-pas to match your mani to your pedi? Rules are made to be broken, but for an easy color combo, pick a shade and go for a darker tone of it on your feet and a lighter version of it on your fingers. Ingredients: butyl acetate, ethyl acetate, nitrocellulose, isosorbide dicaprylate/caprate, adipic acid/neopentyl glycol/trimellitic anhydride copolymer, alcohol, isopropyl alcohol, stearalkonium bentonite, acetyl tributyl citrate, mica, diacetone alcohol, n-butyl alcohol, silica, borago officinalis (borage) seed oil, phosphoric acid, tin oxide, hydrolyzed corn protein, hydrolyzed wheat protein, hydrolyzed soy protein, leuconostoc/radish root ferment filtrate, ci 77891 (titanium dioxide), ci 77510 (ferric ammonium ferrocyanide), ci 19140 (yellow 5 lake), ci 15880 (red 34 lake).